We’ll talk to Ben. Or say, “Hey, Cate, Benjamin is talking to you.” And she’ll point out that he’s not really talking and he’ll be able to talk when he’s bigger. The other day I was babbling to Ben about how he’s getting bigger. And Cate corrected me: “He’s not bigger yet, Mommy.” No, I guess not. Not in the mind of an almost-3-year-old who sees the world as it is. Literally. But, hey, he weighs 15 pounds. So he’s indeed gotten bigger. At least a little. When I say this, I say it as 100% complimentary – she is just like you! She's a thinker and so literal. You've done a good job! 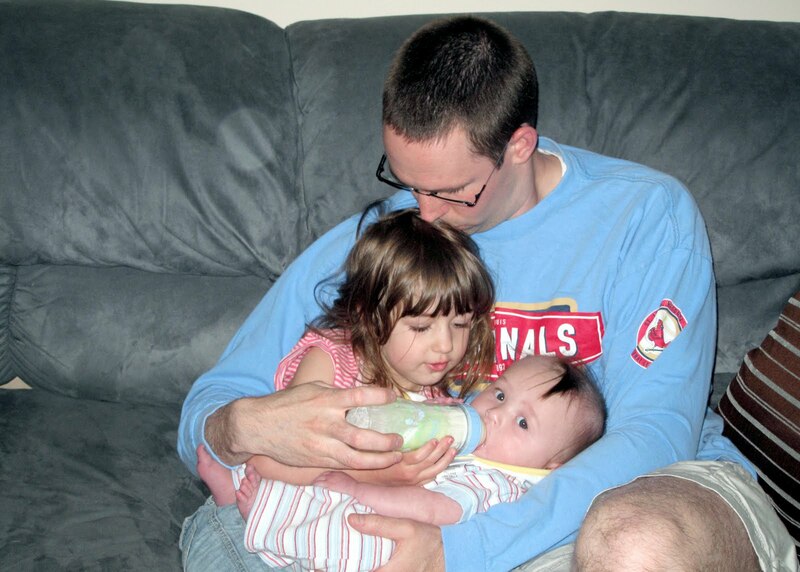 Oh, oh, oh…the picture of Greg and the kids – awesome. So sweet.